Next up in our Ladies Choice evening was India’s Paul John Single Cask #1844, bottled at full cask strength of 60.5%. Based in Mumbai, Paula is an actress – including a Marathi film – film-maker with her partner (Gulbadan Talkies), producer of the Bharatiya Digital Party‘s irreverent web series “Casting Couch” and script writer. She’s the kind of lass that will track down a new whisky experiment from Canada or the US, take an hour off from shooting in Goa to zip over to Paul John to collect a coveted bottle of Peated or pop into WhiskyLive when in South Africa… just because… whisky! The whisky ladies and I have come to associate Paul John whiskies with a distinct character, from the Peated Select Cask (my favourite), to the Bold and Edited expressions available in India. Paul John has quickly become a great staple whisky to keep stocked in the liquor cabinet if you want to impress your friends with high quality Indian whisky. However, on the first try of Cask #1844 most of us were bowled over by the distinct caramel sweetness and had trouble finding complexity underneath. Partly because of the high alcohol level (60.5%), we all had a similar struggle finding new notes on the tongue. However, a generous helping of water helped bring out a few more notes. Overall: Nondescript sweetness, pleasing and non offensive if water is added to counteract the alcoholic dryness. However I personally found the 1st batch of the Select Peated to be my favourite PJ of all time, and wished #1844 could have lived up to my expectations. I think this particular cask contained the pure sweetness that is a favourite component of Paul John malt blends. Although not very complex, the flavour notes presented are unique to the fruity Goan feel of Paul John whisky and it was interesting to have them in a cask strength dram. Aroma: Roasted oak, milk chocolate, pepper, apricot yogurt. The fragrance opens with the addition of a few drops of water, and is shades of orange peel, toasted muesli and peppermint. Taste: At full cask strength, with an intense caramel taste explosion. The taste is drier than the aroma suggests with notes of burnt sugar, mint, malt and apricot. What else did we sample in our “Ladies Choice” evening for the BMC gentlemen? 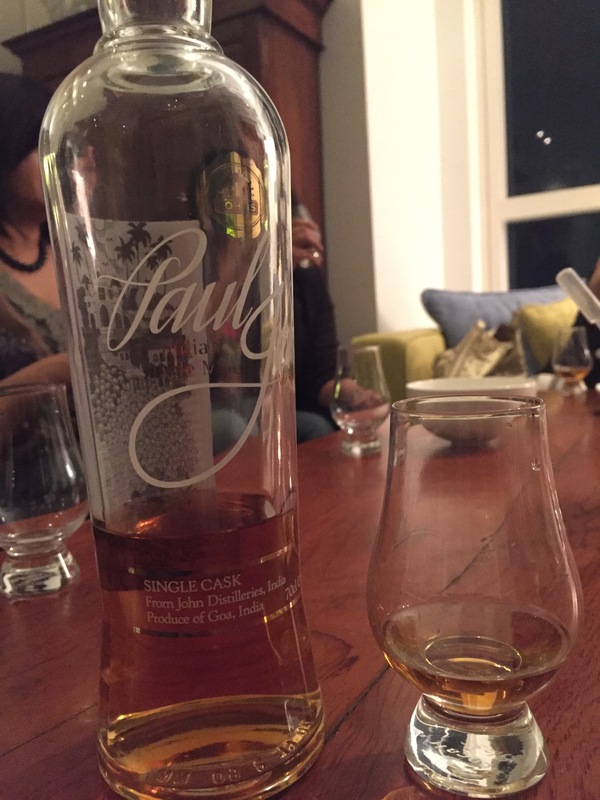 This entry was posted in Beyond Scotland, India and tagged Cask Strength, Paul John, Paul John Single Cask #1844 60.1%, Paula McGlynn, Single Cask by Carissa Hickling. Bookmark the permalink.